19-Feb-2005 -- After being turned away at the military base at 34 North 78 West earlier in the afternoon, I was determined to visit a confluence before nightfall. On the way back from Cape Fear to the North Carolina School of Science and Mathematics in Durham, where I was teaching Geographic Information Systems, GPS, and spatial analysis, I drove to Kenansville, North Carolina. Kenansville looked pleasant in the afternoon light as I turned northwest on Stokes Street that led to Bowdens Road. Passing the Duplin County airport, I turned west on South Country Club Drive. The area of the Dublin Country Club Estates has a few "paper streets," according to Mapquest. While creating the TIGER street atlas for the US Census Bureau, data that ultimately found its way into Mapquest, Google Maps, Yahoo maps, and other online services, this was our name for streets that were planned but not built. I turned northwest on Carlton Drive, passed the new home that was closest to the confluence, and parked about 100 meters beyond it. I walked back to the house with my equipment, maps, and letter, greeting the man and woman who were out front working on their yard. I offered them a USGS map of North Carolina, explained my purpose, and asked them if they would like to accompany me. Mark did so, even though the confluence was not actually on his property. The aerial photograph shows forest where Mark's house stood, and he mentioned that he had grown up in this area and had lived in the new house for about a year. He mentioned that a person could obtain a lot near the golf course for only $30,000. I would have to mention this to my dad, who is an avid golfer. We walked out to the road and north through one of the most tangled fields I had encountered. One has to admire the Native Americans and early settlers who initially cleared underbrush like this for their crops. I had not encountered thorns and vines such as this since searching for several onfluences in Texas. Mark said that this was not the type of place to be hiking in the summer, when the snakes and fire ants were out in force. Within 15 minutes, we were very close to our goal. I took some photographs and then we skirted the pines to the north, where we were able to get within a meter or two of the actual spot. I zeroed out the latitude, but felt no need to step into another mass of thorns to the east in the hopes of zeroing out the unit in both x and y. I did not want to further impinge upon Mark's time, and in addition, I was not certain, as the thorny mass was underneath some pine trees, that I would actually be able to achieve the zero-zero goal. The confluence therefore lies on horizontal ground in a field of thorns, oaks, and pine trees, near a golf course. I reflected on the number of other confluences I have visited that are near golf courses, such as 40 North 75 West in New Jersey. The confluence lies in a rural area where farming coexists with people who choose to live in the country but work in nearby towns. It was a pleasant late winter afternoon, 55 degrees F (13 C), with little wind and blue skies. We saw no animals or birds. The only water nearby was a ditch we had to leap over to reach the field. The GPS gave the elevation as only 33 meters above sea level. 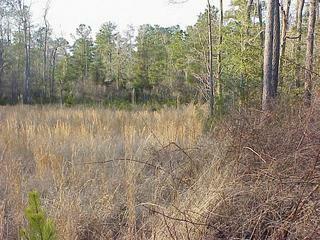 This was Carolina coastal lowland, land just giving way to the hills leading to the piedmont. I had never been to the 35th parallel before, nor the 78th meridian, and it was quite enjoyable to stand in the field there in the countryside. After a few minutes, Mark and I left the field and walked back to his house, where I bid him a good day and walked back to the car. I drove back to the school in Durham, contented that I was able to visit at least one confluence that day. #1: View to the north from the confluence. #2: Joseph Kerski at the confluence site. #3: Ground cover at the confluence site. #4: GPS reading at the confluence site. #5: View to the east from the confluence showing the trees. #6: Nearest house to the confluence, looking northeast toward the confluence that is about 250 meters to the northeast.